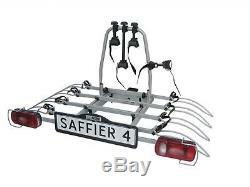 Saffier IV Towbar Mounted Tilting 4 Bike Rack / Four Cycle Carrier. The Saffir IV bike carrier is easy to fit and clamps to any 50mm towball, flanged towballs and swan neck / detachable towballs alike. It comes complete with rear lights and a 2-way 7-pin/13-pin plug to suit both types of towbar electrics. Each bike is supported in individual wheel channels - spacing is adjustable to suit adult or childrens bikes - with a secure supporting arm, meaning no messing with bungee cords and straps. Access to the vehicle boot is quick and easy, even when bikes are mounted on the rack. The rack tilts forwards in seconds with the bikes held in place, and lifts back into place with an easy to use, secure clip system. Storing the carrier when not in use is simple too - the whole rack folds down to store flat. Next generation 4 bike carrier with tilting action to allow access to the boot. Fit all tow balls and all types of bike. Quick and easy to fit and dismount from the towbar. Complete with lock (to towbar). The carrier cleverly tilts to allow access to the car boot, even with the bikes attached. The frame holder will fold flat for easy storage. Adjustable wheel supports for different sized bikes. Complete with strong easy fit straps to hold all sizes of bike wheel. The carrier locks to the towbar. Supplied with both 13 pin continental electric socket and UK 7 pin socket. Socket tool supplied with the carrier for attaching to the tow ball. The towbars are designed to fit standard bumpers. This excludes Sport, Titanium, Zetec and variants etc. To procedure to return an item is as. The goods must be packed by the user in such a way to preserve their integrity and not to cause damage on its return journey. The items must be packed into their original package and mustn't be used. Your safety is our priority. All sensitive information sent between your computer and our servers is automatically encrypted so it's not exposed to potential fraudsters. As a global company with over 10 years experience in online payments, we know how to make shopping online a pleasure. If the item is revealed defective beyond the 30 days from the purchasing we will provide for its reparation and in case it won't be possible we'll provide to replace it with another similar. We are unable to accept any claims for subsequent losses. Any claims relating to the failure of the item needs to be made in writing within 10 days of the problem occuring. Towequipe would not be held responsible for possible costs charged to the user in case of damaged products. This doesn't compromise your legal rights. Towequipe doesn't assume any responsibility also in case of damages caused by inappropriate use of the product for purposes different than the ones it was projected for. Terms and Conditions of Sale. Last update: the 1st of April 2014. Please read these conditions carefully before using purchasing from us. The user is always responsible for maintaining the confidentiality of his account and password and for restricting access to his computer, and to the extent permitted by applicable law he agrees to accept responsibility for all activities that occur under his account or password. He should take all necessary steps to ensure that the password is kept confidential and secure; he should inform Towequipe immediately if there is any reason to believe that his password has become known to anyone else, or if the password is being, or is likely to be used in an unauthorised manner. The user is held responsible for ensuring that the details which are provided to us are accurate, and for informing us of any changes to the information he has provided. You must not use the Towequipe site for fraudulent purposes, or in connection with a criminal offence or other unlawful activity. Towequipe reserves the right to refuse service, terminate accounts or remove or edit content if you are in breach of applicable laws, these Conditions of Use or any other applicable terms and conditions, guidelines or policies. Any fraudulent activity will be shared with the relevant authorities. Visitors may post reviews, comments and other content; send e-cards and other communications; and submit suggestions, ideas, comments, questions or other information, as long as the content is not illegal, obscene, abusive, threatening, defamatory, invasive of privacy, infringing of intellectual property rights, or otherwise injurious to third parties or objectionable and does not consist of or contain software viruses, political campaigning, commercial solicitation, chain letters, mass mailings or any form of "spam". You may not use any false contact details, impersonate any person or entity. Towequipe reserves the right to remove or edit such content. If you believe that any content on or advertised for sale on Towequipe contains a defamatory statement, or that your intellectual property rights are being infringed by an item or information please notify us by completing and submitting a written with urgency. You will have the option to opt out of marketing messages. Please read these conditions carefully before purchasing from Towequipe. Placing an order means you agree to these conditions. The following conditions are effective for all sales agreement and for the supply of services by Towequipe. These conditions and terms doesn't compromise the legal rights of the user. All prices are inclusive the current applicable VAT rate. Towequipe reserves the right to modify prices and/or specifics any time and without any notification. Towequipe can not be held responsible for possible imprecision or mistakes contained inside the fitting instructions or inside the technical documentation of each product. We invite the customers to carefully check the completeness of the delivered goods before proceeding with the installation. Towequipe can not be held responsible for possible costs for that reason. All prices are inclusive of the applicable VAT rate. We endeavour to ensure all details are correct, however all details given are only indicative. The user accept to collaborate with each in-depth examination of the courier and also to reserve the best moment in order to allow the courier to retire the damaged package. Missing packages: if a package is missing, this must be checked by the courier. As soon as the courier has confirmed this a replacement package will be sent using the previous method. If the original package is found this must be refused by the customer so that to allow his return to the sender. EC law requires that all passenger vehicles except for LCV registered from the 1st of August 1998 request a towbar approved according the EC94/20 and also a towball with suitable D and S values. All towbars supplied comply to ISO 1102 and (BS AU 113) regulation the towing height position is to be between 350mm and 420mm from the ground to the towball centre. EC94/20 legislation: all towbars supplied conform to this standard and are continually subject to checking test in collaboration with the Certification Agencies. LEGAL RIGHTS These terms and conditions don't bear on the legal rights of the customers. Towequipe wouldn't be held responsible for (1) the data loss that haven't been caused by an own violation, for (2) whichever economic loss included the profit loss, incomes, agreements, anticipated savings, data or the support of avoidable expenses, or (3) whichever indirect loss or consequential unpredictable. Towequipe will not be held responsible for possible delays or for the lack of respect for his own commitments in these conditions, if the delay or the service interruption pass for causes beyond his control. The laws of some countries don't allow some or all the above mentioned limitations. In case these laws would be applied. All the brands included in this website, not of Towequipe property, are property of the respective owners. ALTERATIONS TO THE CONDITIONS OF USE. We reserve the right to make changes to these Conditions of Use and Service Terms at any time. You will be subject to the terms and conditions, policies and Conditions of Use in force at the time that you use the Towequipe Services. If any of these Conditions of Use is deemed invalid, void, or for any reason unenforceable, that condition will be deemed severable and will not affect the validity and enforceability of any remaining condition. Towequipe is a business unit of an organization recently born from the union of a professional network that always have been linked to the towbars world. To reach this objective we work only with products manufactured in Europe, with quality certification whose competitiveness on his own market has been proven by many undisputed prestige and leadership. Our team are not only involved with sales of towing but advise both technicians and installers, with a background of uniqueness and higher experience completely at your disposal. In our team take part not only our business operators but also technicians and installers, with a background of uniqueness and higher experience completely at your disposal. The item "Saffier IV Towbar Mounted Tilting 4 Bike Rack / Four Cycle Carrier" is in sale since Friday, March 20, 2015. This item is in the category "Vehicle Parts & Accessories\Car Accessories\Touring & Travel\Bike Racks". The seller is "onlytowbars" and is located in Nuneaton, Warwickshire.